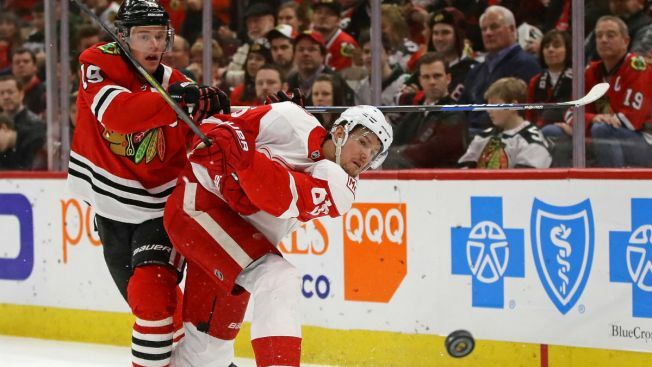 Tyler Bertuzzi and Anthony Mantha each had a goal and an assist, and Detroit beat the sloppy Chicago Blackhawks 4-0 on Sunday. "I thought it was a pretty complete game," Red Wings coach Jeff Blashill said. Dylan Larkin and Mike Green also scored for Detroit, which had dropped two in a row after a four-game winning streak. Petr Mrazek made 27 saves in his second shutout of the season and 12th of his career. "Across the board, we weren't good enough," captain Jonathan Toews said. "We have a lot to think about on our break here. Obviously, there's a ton of hockey to go." Chicago (22-17-6) had won three of four, including a 2-1 victory against Central Division-leading Winnipeg on Friday night. But the Blackhawks looked sluggish for most of their final game before their bye week. "That was tough to watch," coach Joel Quenneville said. "We used the word brutal. I thought that might be complimentary. Out to lunch. Use 'em all. That wasn't good enough. Nowhere near good enough." Bertuzzi, the nephew of former NHL forward Todd Bertuzzi, made it 4-0 when he punched in his first career goalon a rebound 13:37 into the third period. He also has five assists in 10 games this season. "I think I took two whacks at it before it actually went in," Bertuzzi said. "I was excited that it squeezed through his (legs)." The Red Wings (18-18-7) played without forwards Justin Abdelkader and Darren Helm, who were sidelined by lower-body injuries after they got hurt during Saturday's 4-1 loss at Pittsburgh. Turgeon got nine minutes of ice time in his NHL debut in front of his father, Pierre, an assistant coach with the Los Angeles Kings who played 19 seasons in the league. "That meant a lot to me that they let him come here," Dominic Turgeon said. "It was exciting for me and my family that he could be here to watch it." Detroit grabbed control with a pair of goals in a 2:10 span in the first period. First, Andreas Athanasiou drove to the net before throwing the puck in front to Larkin, who knocked it in for his seventh of the season. Mantha then made a great pass to a trailing Green, who sent a one-timer past Jeff Glass at 6:18. "I thought we were fresh from the start, but I think also we rolled lines right from the beginning and kept (shifts) short and that helped," Red Wings captain Henrik Zetterberg said. Chicago killed off three power-play chances for Detroit in the second but was unable to put much pressure on Mrazek. The Red Wings then iced the game when Mantha pounced on a pass from Zetterberg and shot it by Glass' right shoulder from the right circle for a 3-0 lead at 5:46 of the third. It was Mantha's team-high 15th goal. Zetterberg picked up his 603rd career assist, moving him within one of tying Pavel Datsyuk for fifth on the Red Wings' career list. The crowd of 21,830 booed as the final seconds ticked off. Glass finished with 22 saves for Chicago, which dropped to 12-8-2 at home.